87 Monster Math Centers! Core Curriculum HANDS ON Fine Motor Centers! Has corresponding math objectives on pages. All activities work towards counting, sorting, addition, writing numbers - ALL with hands on manipulatives using tongs, coloring or scissors labs. Created by Jan McCleskey, MA, OTR from The Handwriting Clinic/First Strokes. This is a blend of hands on fine motor development activities and math core curriculum centers. Get those little hands moving. Perfect for center time! Allows students with special needs to participate in core curriculum activities - perfect for inclusion! Perfect for special education! Perfect for occupational therapy to blend working on fine motor skills and academic objectives - allows a team approach to working with a child! 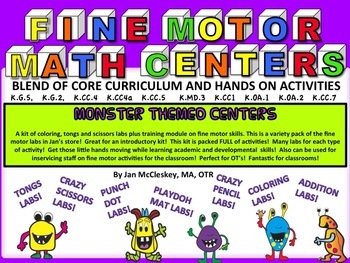 This is a very comprehensive fine motor centers kit. Most activities are math centers. 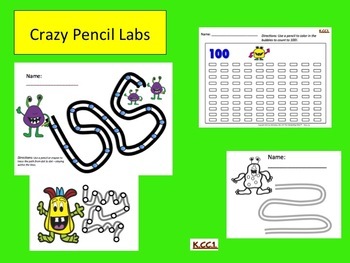 If you have ever searched Jan McCleskey's store, and like the tongs labs, the crazy pencil labs, the crazy scissors labs, the creative coloring labs - THIS is the file for you because it incorporates ALL these ideas into these math centers! See preview to get a better idea of all the activities in this kit. 95 pages - 82 labs! All labs have instructions with academic objectives, and therapeutic objectives and simple instructions to make the activities ALSO work on fine motor development, pencil control, scissors control. 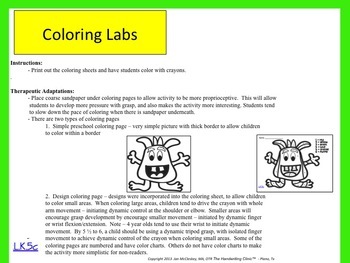 This is THE file to get those little hands moving while also working on academic objectives. Most all labs/centers are able to be stored in a binder for the clutter free teacher or therapist! This kit is also the perfect tool for use in inservicing staff on fine motor development (printable instruction pages), and blending academic goals and objectives. Perfect for therapy teams when doing consultation in the classroom! If you like these activities Jan has created over 50 fine motor files on TPT (adding more all the time), using the Crazy Pencils, Crazy Scissors, Tongs Labs, Coloring Labs, Punch Dot labs - you will find MORE of these activities on TPT in different themes! Just getting started? This kit, or the Sea Animal Fine Motor Kit or the Transportation Fine Motor Kit (these last two are hard goods - comes with blocks!) are available on TPT. "Follow" Jan McCleskey for updates on new fine motor labs - all work towards developmental, academic, and core curriculum goals! Minimize the worksheets, get those little hands moving ! Labs are FUN!